A few weeks ago, I was really craving a real hearty meat and potatoes kind of meal. I guess I was in the mood for some comfort food. So when I was meal planning and trying to come up with something to make, I stumbled upon a recipe for Swedish meatballs and knew that was what I wanted. 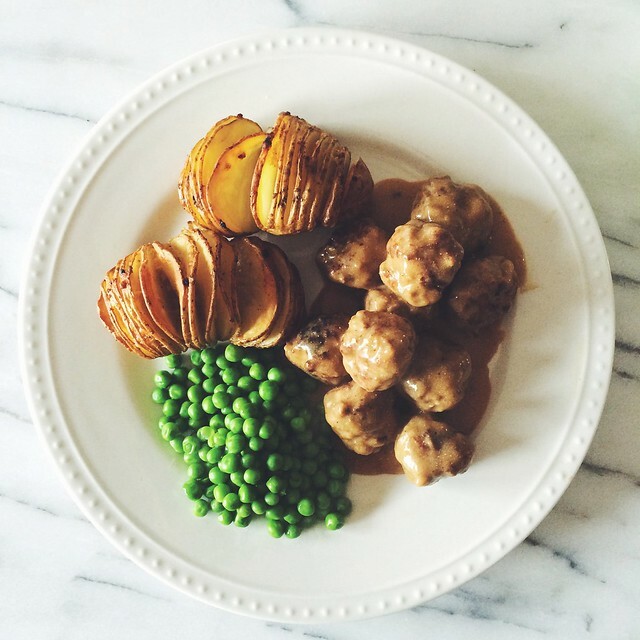 The recipe for the Swedish Meatballs I used is from Damn Delicious, a go-to food blog when I'm trying to find something good to make for the week. And the accordion potatoes (or Hasselback baked potatoes as some call them), are from Family Fresh Cooking. I knew I didn't want to make mashed potatoes with the swedish meatballs, only cause it seemed like the typical thing to do and I wanted to be different (surprise surprise), so when I came across the recipe for accordion potatoes, I knew it was the perfect side dish to the meatballs. If I changed anything to either recipes, I made a note of it next to the ingredient or step, but for the most part I stayed true to both recipes and both were smash hits. I will say though that the swedish meatballs were a bit time consuming so if you don't want to be standing at the stove for a while, I suggest either baking the meatballs (wish I had done that) or don't make it at all because I was standing at the stove for a looong time cooking those meatballs. - Heat 1 tablespoon olive oil in a large skillet over medium heat. Add onion, and cook, stirring frequently, until onions have become translucent, about 2-3 minutes. - In a large bowl, combine ground beef, ground pork, Panko, egg yolks, allspice, nutmeg and cooked onion; season with salt and pepper. Using a wooden spoon or clean hands, stir until well combined. Roll the mixture into 1 1/4-to-1 1/2-inch meatballs, forming about 24 meatballs. - Add remaining 1 tablespoon olive oil to the skillet. Add meatballs, in batches, and cook until all sides are browned, about 4-5 minutes. Transfer to a paper towel-lined plate. - To make the gravy, melt butter in the skillet. Whisk in flour until lightly browned, about 1 minute. Gradually whisk in beef broth and cook, whisking constantly, until slightly thickened, about 1-2 minutes. Stir in sour cream; season with salt and pepper, to taste. - Stir in meatballs and cook, stirring occasionally, until heated through and thickened, about 8-10 minutes. - Serve immediately, garnished with parsley, if desired. - Pre-heat oven to 425 F with rack in the middle of the oven. - Lay potatoes flat on cutting board and starting from one end of the potato, make slits about 3-4mm apart. Cut to about 1/4 inch from the base of the potato. Be careful not to slice all the way through. The potato will fan out a bit as it bakes. - Combine olive oil, garlic, salt, pepper, smoked paprika and parmesan cheese in a small bowl. Carefully insert pinches of this mixture in between the slits of the potatoes. - Rub the outsides of the potatoes with residual oil. Arrange potatoes on baking sheet and bake for about 40-45 minutes. The inside should be cooked through and the outside of the potato should be a bit crispy. - Garnish with additional salt, smoked paprika, pepper, parmesan and chives.